TOKYO – March 22, 2018 – LINE Corporation will begin IFTTT support for its cloud AI platform “Clova” today to give users access to a wide range of linked services. Clova has been continuously evolving since it was first announced at the "Mobile World Congress 2017" in March 2017. The smart speaker "Clova WAVE" was the first Clova-powered device to be launched, followed by the LINE character-themed "Clova Friends." As part of the first phase to open up the Clova platform to third parties, the IFTTT support (starting March 22) enables users to enjoy using a variety of convenient services such as "Notify Clova (automatically) upon leaving school." IFTTT allows different web services to be easily linked to become a single, automated, new service. Because users can choose to either freely combine various services themselves or use existing linked services, by supporting IFTTT, Clova will become even more convenient and enable users to do much more than before. LINE will accelerate its efforts to enhance the usability of Clova, and make its smart speakers an integral part of every family. Clova will use its IFTTT support to link with various external services to provide a number of sample services to users. These will include "notifying the user when a new feature is announced in the official Clova blog," "congratulating the user when he or she achieves his or her weight loss goal," and "notifying the user when a new card is added to his or her Trello list." 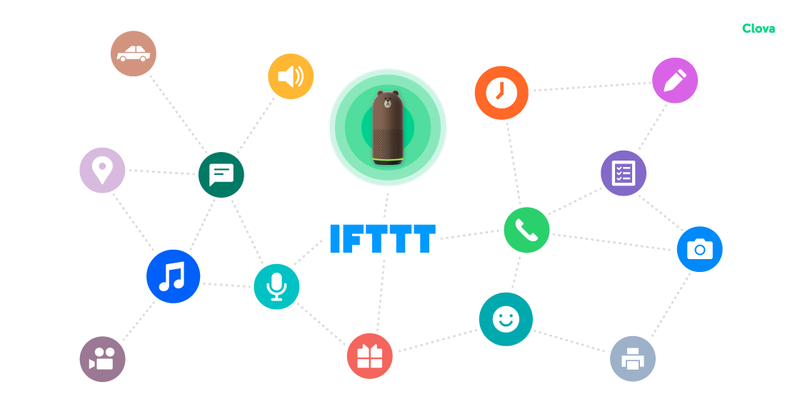 IFTTT, which stands for "If This Then That," is a web service that takes individual web services that are already useful on their own, and connects them together based on the IFTTT logic to enable even greater possibilities as a combined, new service called an applet. *1 Approximately 600 web-based services across a wide range of categories including calendar, location, health, and development tool support IFTTT, and users can start using sample applets right away or build their own by connecting services themselves. While linking web services together was always thought to be a complicated process as it requires programming knowledge, the surge in the number of IFTTT-supported services has enabled a wide variety of services to be linked without the need to program. *1: Within the scope of the IFTTT service, applets are new services created by linking different services. "Triggers" are the "this" part of an applet that triggers the action, and "Actions" (the "that" part of an applet) are the output that results from the input of the trigger. Please visit the LINE Engineering Blog for more details. New features are added to Clova every day. Clova is notified when a new feature is added. Clova is notified when the LINE Engineering Blog is updated. Clova congratulates the user when he or she attains his or her weight loss goal. Clova congratulates the user when he or she achieves his or her daily workout routine. A notification is automatically sent to Clova when the user leaves his or her office. A notification is sent to Clova when the user is tagged in a photo on Facebook. Clova is notified when the user receives a pull request in his or her GitHub repository. Clova is notified when a new card is added to a specific board on Trello. * A personal LINE account, the LINE Clova app, and an IFTTT account are required to use this product. The LINE Clova app requires Android 4.4 or above/iOS 9.0 or above to run. User registration can be performed by connecting to the Clova Friends unit from the LINE Clova app. Clova has always been improved through updates based on user feedback and requests. Through IFTTT, Clova aims to continue to support users as a "growing speaker" by making their day-to-day lives even more convenient and enjoyable. Also, as it strives to fulfill its corporate mission of "Closing the Distance," LINE will use Clova to help bring users as close as they want to information, services and the people in their lives.